No matter the time of day or night you need a emergency locksmith in Reading, you won’t be charged a call out fee. 95% of our calls can all be dealt with within an hour of your initial call authorising to attendance. With a 1 hour response time for a Reading Locksmith our service is hard to beat. It doesn’t matter if it’s a cold night or a hot day. As locksmiths in Reading, we're on hand 24/7 to make sure that you can get into your property, even when the keys are missing. As an established locksmith business in Reading, we're are able to offer a comprehensive range of locksmith services. Being fully trained and highly experienced, we can handle any type of locksmith work. With an emergency locksmith services that covers the whole of Reading and the surrounding areas in Berkshire and the Thames Valley. No matter what time of day or night you need a locksmith, Lock Solutions are on hand to assist. When it comes to needing a locksmith in Reading, be sure to get in touch with Lock Solutions. We are a small, independent, family-run locksmith business in the heart of Reading. Our aim is to help those when they need a trustworthy locksmith. You can always rely on Lock Solutions for lock smith services in Reading. Wayne, owner and manager of Lock Solutions, can be contacted at any time of the day or night. So when you're in need of locksmith services in Reading, don't hesitate to get in touch. We’re one of the best 24-hour locksmith companies in Reading, Berkshire, Thames Valley and the surrounding areas. As the owner of a lettings agency, I regularly need the services of a locksmith. Used Wayne from Lock Solutions now for a number of years and always found him to be honest, reliable and trustworthy. I have no hesitation in giving him keys to any of my properties to carry out work necessary, without the inconvenience of my staff or myself leaving the office to accompany him. In my role as Maintenance Manager of a company called Magal AWT Engineering I have lost count how many times I have called on Wayne’s Help as a Reading Locksmith. I have used other company’s in the past and have always been let down. Even if it’s something out of his comfort zone he’s always there to help. Always professional but easy to talk to as well. I would really recommend his company Lock Solutions. Is there a Locksmith Near Me in Reading? When you find yourself searching online for 'locksmiths near me', it's good to know that Lock Solutions are well positioned to reach you in a lock out emergency. Since starting in early 2006, we have been able to help hundreds of people locked out of their homes. We have also helped to gain access to and replace any lock for various businesses in the Reading area. Lock Solutions work with materials provided by trusted lock makers such as Yale, Chubb and Union. Working with these high-quality materials which are the key ingredients to our local success and positive customer feedback. Go and visit our testimonials page to see what our customers are saying about us now. Having worked throughout Reading, Berkshire and the Thames Valley for a number of years, we have developed a well-known reputation for the quality of the locksmith services we provide. With years of experience in the locksmith industry, we have honed and developed our skills to ensure we provide a professional and efficient service. We aim to attend all locksmiths call outs in the reading area, within the hour. With our emergency locksmith service, we have you covered day and night for the services that we provide. Whether you're in need of key cutting or help getting into your property, then please don't hesitate to get in touch with Lock Solutions. One of the many reasons for our popularity is due to our amazing 1-hour response time for emergency locksmith call outs. We also understand that an emergency is an emergency, which needs to be resolved as soon as possible. Come rain or shine, light or dark, we are here for you 100% of the way. Wayne is always on hand should you need a helping hand. So should you need an emergency locksmith around Reading, or be looking for a locksmith in your area, you can call Wayne directly on his mobile phone at 07711 906667. For all other locksmith enquiries, you can email Wayne at info@lock-­solutions.co.uk or call the office on 0118 336 0177. You can also find us listed in the Yell website. We're your local locksmith in Reading, Berkshire and the Thames Valley. Fantastic service, I required Lock Solution's services 10pm on a Sunday night. They arrived within half an hour and had me back in my flat, complete with new lock, remarkably quickly. The gent who carried out the work was a very nice chap and the charges were quite reasonable, considering the short notice and time of day. I'd definitely recommend them. Wayne was an absolute lifesaver! I stupidly locked my keys in the house early in the morning! The response time was around an hour which was great for an emergency service! Wayne was precessional and helpful! Quick response and same day service. Genuine and honest company who looked and found a better and cheaper solution to gain entry to the property. Don't get many like this. Wayne has been the most amazingly professional and responsive locksmith that you could possibly imagine. When we had some keys stolen he came out within an hour of calling to replace the lock. When we had some problems with the operation of that lock he came out, again within an hour, and replaced it. Not only that he helped me shave a bit off the door which was causing it to stick! Fast response, same day service, very efficient at getting the job done. Also helped to sort a long-term issue with the door closure while here! Nice guy, good fun. Would highly recommend. I can highly recommend Lock Solutions for excellent service. Wayne arrived very quickly and had the whole job finished within an hour of me first calling him. I wouldn't hesitate to use the company again if I needed to. Very friendly and trustworthy, keeps you informed and offers all the options available. Would happily use again if needed. Very pleased with this chap. He arrived on time, got the job done speedily and was also helpful beforehand by explaining exactly what we needed to buy in (handles and escutcheons), so that he could complete the work in one visit. All good. Wayne came at short notice to improve the security on a front door. He arrived on time and I'm pleased with the workmanship. Good value for money. After our 2 year old managed to lock us out our house with her still inside , Wayne was really quick at coming round and getting us straight in to tend to her . Brilliant bloke , good at his job and very reasonably priced !!! Can’t praise him enough !!! Great service overall! I needed a new secure lock to be installed on my door and reasonably soon. I got in touch with them and the next morning the lock was installed. The quality of the job was high standard and the price very reasonable. The locksmith was very kind and professional. He did exactly what we agreed over the phone. Would definitely prefer them in the future and recommend them. I recommend the service of Mr. Wayne Colvin. I needed to put a new lock on my door and he did a great job. He is excellent and very polite. He answered me promptly and arrived on time at the agreed day. I was extremely satisfied with his work. Very fast in response and so friendly. There was no problem in opening the door and was inside in no time. Would absolutely recommend! Perfect service and great communication beforehand. Wayne was friendly, efficient and a pleasure to deal with. I would happily recommend him to anyone in need of his services. He left no mess and really seemed to care about doing a good job. Wayne was prompt and very professional, very friendly guy, noting too much trouble. He used quality replacements for my broken lock, and very fairly priced. All safe again now. Would highly recommend. Excellent service - arrived within 20 minutes of the call, and had the (locked, non-operating) front door open and lock replaced inside an hour. No damage, no fuss. Thanks Wayne! 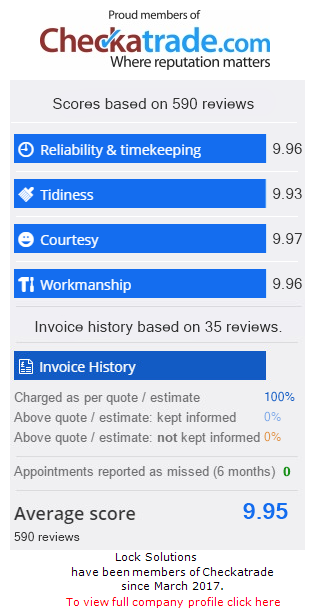 Excellent response time (under an hour), did what they said they would do, reasonable price (no emergency call out is cheap) and a really nice guy! Would definitely recommend. Work involved replacing a worn out mortice lock. Wayne quickly determined that a new lock was required and fitted it expertly and efficiently. The price for the job was very reasonable. Would happily use the firm again. great service. Quick to get back to you and offered great advice. would recommend! Can't complain on the response time. I left the house at 5:20am without my keys so was straight on the phone. Arrived and got in by 6am. Given it was super early fantastic response time. Was pricey but fair for the time i guess! Wayne came out the same day at very short notice to fix our broken front door handle. He was efficient, professional - completely faultless. I would not hesitate to call him for any future work. Lock Solutions work for our office in Maidenhead as our 'go to' locksmith for our rental properties. He is always efficient, friendly and on call whenever we need him. He has even done work for the office itself a fair few times! Awesome Service.Competitively priced work with a professional and friend guy. Went above and beyond. Would highly recommended. Amazing, managed to come and help at very short notice. He was very efficient and professional, i’m Glad I now have a go-to locksmith whenever I may next need. Highly recommend. I recently had need of a locksmith on behalf of a nervous, elderly friend whose front door locks had thoroughly seized up. Wayne was recommended to me and he came out on a Saturday morning. The lady in question was absolutely delighted with the service she received and I couldn't thank Wayne enough for his care, proficiency and speed of his response. I will not hesitate to call on him again and would thoroughly recommend him to others. Wayne was excellent, very friendly and kept in touch until he arrived. Wayne was very knowledgable and offered great advice on replacing my lock, he was reliable and efficient and fitted in with my timetable.I would definitely recommend his services to anyone. Quick response when I locked myself out of my new home. Thks! Really excellent service! We called relatively late in the evening and after 9pm. Wayne arrived within the hour and fitted two new locks. I would wholly recommend Lock Solutions without reservation. Thank you! Excellent, quick service at a reasonable cost. I wouldn't hesitate to recommend them. Needed a new lock on the door as I had a faulty electric key entry system. Quite a challenge as the faulty system didn't match up to standard locks and needed electric work to remove wiring. However, this was no problem for Wayne. From the moment I contacted him, he fixed a date and time and was punctual. Even though it was a Saturday, he was keen to come out to see what he could do to assist. Property security is clearly his priority. When he arrived, he managed to carry out the work to an outstanding standard and even cleaned up. No job too big and so polite. Great that he rigorously tested the lock and I would highly recommend. An absolute pleasure and priced fairly. A sure choice for anyone that needs a locksmith. I had locked myself out of a bedroom in my house and needed to gain access. I called lock solutions and they were able to give me an appointment the next day. They turned up on time, gain access to the door and were very polite and efficient. Would highly recommend. Naturally a very annoying situation locking myself out but the cheeriness of Wayne made it much more bearable. Got to me and unlocked the door within 20 minutes of me calling, all whilst dodging the snow avalanches coming off my roof. Great service, cheers. What a lovley locksmith! Called, he was round within 20 minutes, did the job quickly and efficiently. Happy to have him in my home. Wayne from Lock Solutions was very professional and completed the task without any problem. I would highly recommend this company to anyone who wants a good service. Thank you again. Really fantastic and prompt service. Our door was fixed quickly and the service was great. Thank you. Wayne is really responsive, reliable, honest and does a great job. I’ve used him a number of times at my house, my let property and my mum’s house and would highly recommend.